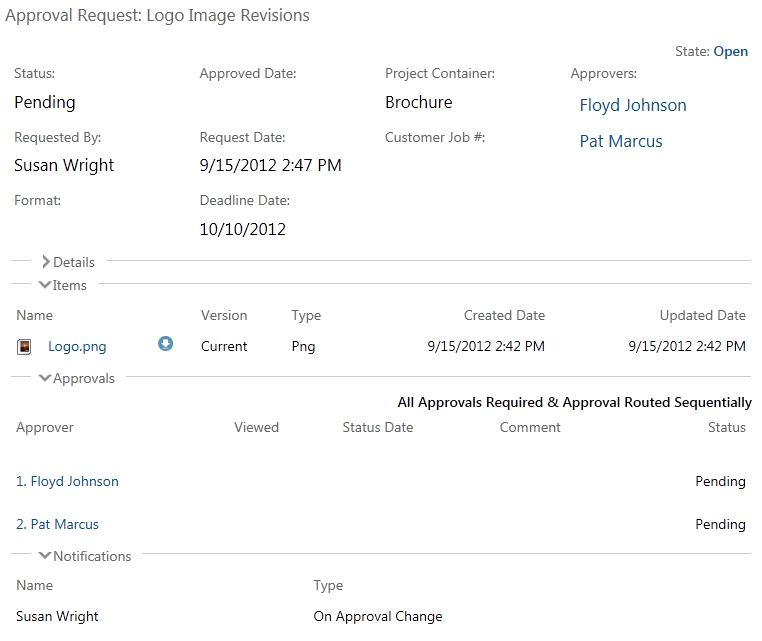 Approvals are added into Project Insight as items from the Approval Requests selection in the Add drop-down menu. You may choose to display Approvals you are assigned as the Approver on, to Dashboards, see Dashboard Components. Upon opening an existing approval, you will see the item(s) requiring approval, as well as the list of approvers requested to review and approve the item(s). In the above example, approval is required for the Logo.png image within the Brochure project. Floyd Johnson is logged in and reviewing it, which is why he has the Approve/Deny link in the Approved column. Susan Wright has set the approval to notify her upon each change, meaning that she will receive an email notification after each approver approves or denies the request. 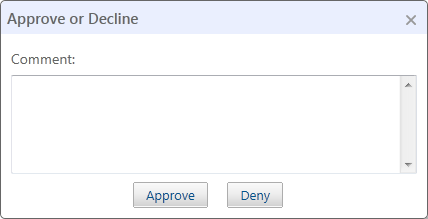 Upon clicking the Approve/Decline link, Floyd will be presented with a prompt to approve or deny the approval request. Comments may also be added by the approver. The approver does have the option to log comments along with an Approve or Deny action. If Floyd approves, Pat will be notified of a pending approval. If Floyd denies the approval, this approval process ends due to the setting that states "All Approvals Required." Approval Requests not only display within the item to which they were added (i.e. in a folder view), but also within an item detail view if the item was selected for approval within the Approval Request. For example, the following Approval Request named Logo Image Revisions could be in any folder, but it displays in the detail view for the Logo.png item as follows because the Logo.png file was selected for approval within the Approval Request.